Since 1900s, Schweizer Orchards has been producing a wide selection of top quality wholesale fruits, vegetables, and now Christmas trees. Our season starts around mid-June and continues until Christmas. In early summer we start with squash, cucumbers, tomatoes, and peppers and then move into our biggest summer vegetable - sweet corn. We produce a bi-color sweet corn packaged 50 dozen loose in a 24 inch tall bin. By late July we offer local peaches, packed in 25 pound boxes. 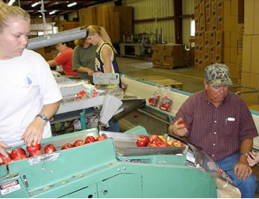 In mid to late August, along with our vegetable packing lines running, we start to pick and pack apples. 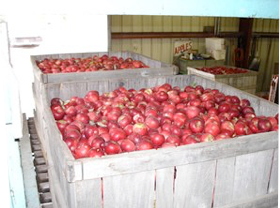 We pack extra fancy, fancy, and combination grade apples in a variety of packages including trays, 3 and 5 pound poly bags, loose fill bushels, and drawstring peck and half peck bags. At this same time we are picking and packing many different sizes pumpkins. We continue to pack apples through mid-November until Christmas tree season begins. During that time we cut, shake, and wrap pine and firs and start making handmade Christmas wreaths through mid-December. Our entire family participates in the operation of the many stages of picking and packing our many varieties of produce. We have many cold storage facilities with loading docks and parking lots to make your pick-up easier. We would love to hear from you to assist you in your wholesale needs.